The October Director's Seminar will feature Beckman Postdoctoral Fellows Brad Deutsch and Sarah Erickson-Bhatt. They will present on Thursday, October 2 at noon in Beckman room 1005. Lunch will be provided. In synthetic optical holography (SOH), a hologram is assembled point by point in a scanning optical system. This lets us perform holographic experiments in situations where a reference would be difficult or impossible to construct, such as in near-field microscopy. It also provides the opportunity to study and implement nonlinear reference phases. Brad Deutsch has been a Beckman Postdoctoral Fellow since 2012. After earning his Ph.D. at the Institute of Optics at the University of Rochester in the field of nano optics, he came to Beckman to work with professors Scott Carney and Rohit Bhargava. 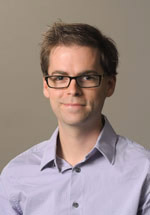 His research interests include computational and experimental microscopy and spectroscopy. Intraoperative assessment of human tissue during surgical procedures remains a challenge. Optical coherence tomography (OCT) provides a potential method for rapid, high-resolution imaging of human tissue during surgery. In this talk, a novel handheld surgical probe-based OCT system is introduced, which is used by the surgeon during breast cancer surgeries to image the tumor cavity in vivo, immediately following tumor removal in order to detect the presence of any remaining cancer. OCT images with micron-scale resolution enable intraoperative visualization of areas of tissue heterogeneity and disorganized features indicative of malignancy, compared to more uniform regions of normal tissue. This demonstrates, for the first time, the in vivo imaging capability of OCT for real-time intraoperative assessment of surgical tumor margins. Sarah Erickson-Bhatt has been working in optical imaging research for the past eight ears. She completed her Ph.D. in biomedical engineering at Florida International University, Miami, FL in 2011, supported by a Presidential Fellowship from the University Graduate School and a Predoctoral Fellowship from the Department of Defense Breast Cancer Research Program. Her Ph.D. research focused on diffuse optical imaging for breast cancer diagnosis. After graduating, she expanded the work into clinical studies under a Postdoctoral Fellowship from the American Cancer Society and Canary Foundation. 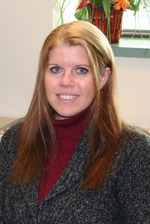 She is currently a Beckman Postdoctoral Fellow and is working with the Biophotonics Imaging Lab, headed by Stephen Boppart, in the clinical translation of optical imaging methods such as optical coherence tomography and multi-photon microscopy toward intraoperative diagnosis and surgical guidance.